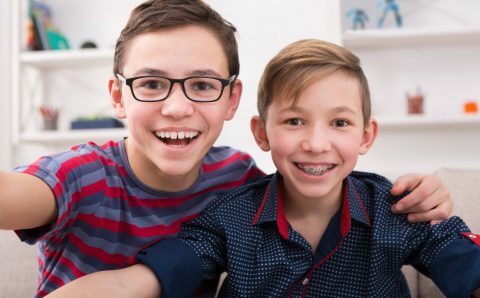 Have you ever asked yourself, “Does my child, or even myself, need braces?” If so, you’ve probably also wondered, “How much do braces cost?” Both are logical questions to consider when deciding on your or your child’s smile, confidence, and health. While many people believe braces are a cosmetic treatment, the decision to get braces is about more than just the appearance of your smile. There are other important benefits to consider when deciding if braces are right for you or your child. So, what are the ways braces help improve one’s health? Looking at all of the ways braces can have a positive impact on your health, it’s easy to see that braces are worth every penny, regardless of the cost. But what exactly goes into determining the cost of braces and ultimately answering the question, “How much do braces cost?” Let’s dive deeper into the different factors that can impact the cost of braces. There are a variety of different orthodontic options (braces): traditional metal braces, Invisalign, and clear braces. Each type has its benefits and are best suited for specific cases. Choosing the right solution is important to achieve successful results and reduce the amount of time needed to get results. Just like the cost of braces, the amount of time needed for braces to properly align the teeth and jaw will vary case by case. Some patients may only need a few months, while others may need a year, or even more, to get the correct alignment for a healthy bite. Depending on the severity of the misalignment, only certain methods of correction will work, limiting options, such as Invisalign, and therefore changing costs. While some patients may only need a brief period with braces followed by a retainer to fix a minor misalignment, another patient may need traditional braces for an extended period of time to address a severe misalignment. Sometimes additional dental care is needed prior to or after braces. This can include the need to remove a tooth, or implant a tooth where one (or more) is missing. The need for additional dental work can add to the cost of braces, and again, can only be determined on a case-by-case basis. Getting braces is truly an individualized treatment and should be discussed during an orthodontic consultation. During the consultation you will have the chance to discuss your needs, talk through treatment options and put a plan in place to achieve a healthy smile. Ready to schedule your complimentary braces consultation? Find a PERFECT TEETH office in Colorado, New Mexico, or Arizona or call us at 844-717-9588 for more information or to get scheduled today to take advantage of our braces special and get started today! *$3,675 promotional price based on 24 months of orthodontic treatment. Monthly payment will vary based on length of treatment. Additional treatment may be required and is not included in promotional price. Reviewed by Dr. Robert Judd, Orthodontist at PERFECT TEETH – 88th & Wadsworth.